Home | Toddler | Toddler Milestones | When Should A Baby Start Talking? While many parents find these cooing and babbling engagements with their baby adorable, it’s important to note that these are also significant milestones in every baby’s language development. Recent studies have proven that the first months and years leading up to your baby’s first word are vital cornerstones in his language capabilities in later years. In short, it’s never too soon to start helping your child learn to communicate. 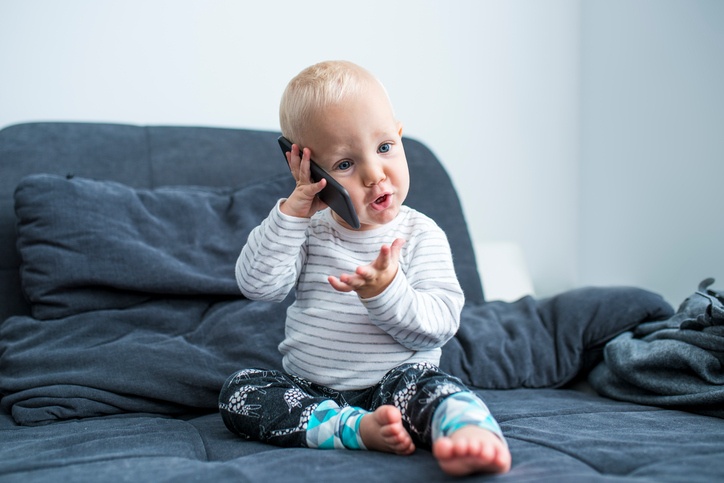 Talk to your baby: The first rule of thumb when helping your baby move towards a first word is to talk to him...a lot. Even during phases when your child isn’t saying much, it’s important to remember that he can understand the words he’s hearing. Tell your baby about what you’re doing, what you have planned, etc. to help get them used to different words and sounds. Use books and music: Children love being read to, at any age. Beginning a reading routine with your baby is a great way to help them develop a love for words. Additionally, music can help extend language recognition and understanding. Sing-song nursery rhymes and other age-appropriate CDs with easy-to-distinguish words can help put your baby on the fast track to language mastery. Listen: Of course, conversation is a two-way street; listening to your child’s attempts at language can help her build conversational confidence. Looking for other tell-tale signs of communication, such as facial expressions and body language, can help give you the cues you need to respond accordingly to your child’s words. Finally, by the time your child hits the three year milestones, she will have roughly 300 words that she uses regularly and will even be able to conduct conversations with those around her.